A man who killed a teenager by setting him on fire during his 18th birthday party has been jailed. 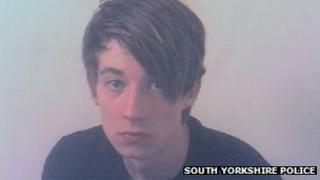 Steven Simpson, 18, from Barnsley, South Yorkshire, died after sustaining "significant burns" last June. Jordan Sheard, 20, of Darfield Road, Cudworth, received a three-and-a-half-year sentence at Sheffield Crown Court. The court heard how Mr Simpson was bullied at his celebration and tanning oil was poured over him by other people at the party before he was set alight. Mr Simpson, who had Asperger's Syndrome and learning difficulties, was bullied during the party at his flat in Cudworth due to his disability and sexuality, prosecutors had said. A judge heard how he was told to take off his shirt and encouraged to dance around before having obscenities scrawled on his body. Sheard, who was egged on by others, set light to the teenager's groin area after he was sprayed with suntan oil in the early hours of 23 June. Mr Simpson was taken to a specialist burns unit at Pinderfields Hospital, in Wakefield, but died two days later. Crown Prosecution Service lawyer Tim Warburton said the teenager had recently started college where he was studying life skills and had made some new friends, who he had decided to invite to his party. Det Ch Insp Sean Middleton said: "Steven was described by all who know him as a very caring and likeable young man, whose family will miss him greatly. "His generous spirit was taken advantage of and a single thoughtless act resulted in his death."